Having a shoulder rig is one of the options you have if you want to conceal your gun from the public eye. This can be extremely useful when you need to draw your gun while in a sitting position (for instance, driving in a car). The double shoulder holster lets you put your gun and your ammo magazines in one place. The double shoulder holster is not commonly used by expert gun owners, but rather used by inexperienced and aspiring shooters. This is least used since it requires you to wear a layering garment like a jacket to conceal it. The shoulder holster can be commonly seen being used by cops and actors on TV shows and cinema movies. If you love hunting, going on outdoor hikes, or are actively involved in the concealed carry community, then you must surely relish the idea of being able to have double firepower. The double shoulder holster gives you the much-appreciated opportunity to have two handguns at your disposal anytime and anywhere. Double shoulder holsters naturally are designed for heavier loads than the single holster. As a result, most quality double shoulder holsters in the market are padded for comfortability, made from durable materials, and feature a double-stitched design. The holster to be reviewed displays all these properties and then some. This double shoulder holster is made by Pro-Tech Outdoors. It’s basically in the hall of fame of shoulder holsters. It is designed to carry two guns at once and yet still offers the option of alternating it into a single holster. By detaching any of the gun holsters and replacing it with the accompanying large magazine pouch, the holster can be transformed from its dual gun carrying capacity into a single holster with abundant space for extra ammo. The Pro-Tech Double Shoulder Holster comes with two holsters positioned on both sides of the body. It features a horizontal orientation or layout, as the guns are positioned across the torso region. It also includes a double magazine pouch that can replace the second gun holster for users wanting a single holster and an ammo carrier for their automatics or speed revolvers. This dual shoulder holster features a plastic adjustable spring action thumb break for securing the gun in place. This double rig gets the job done and is made with excellent workmanship. It distributes the weight evenly around your shoulder, which brings you comfort while moving around. The following are other features this shoulder rig has. The exterior of the holster is made from Pro-Tech’s patented Cordura ballistic nylon. The holster’s interior consists of Velcro, nylon lining and foam paddings where necessary. It is also designed with a vinyl vapor material covering the interior layer. This vinyl barrier serves to prevent moisture from entering your gun, as well as the nylon lining and the foam paddings. There is also a protective webbing over the Velcro bits to prevent dirt, debris, and any other foreign object from reducing the efficiency of the Velcro material. The holster is singly stitched while the pressure points are double stitched. This stitching is done with strongly bonded nylon. The edges of the Pro-Tech Double Shoulder Holster are turned under to minimize the occurrence of fraying. The Pro-Tech Dual Shoulder Holster can accommodate all automatic guns with barrels ranging from 4.5″ to 5″ such as Beretta, Bersa, Browning, CZ, Colt, Glock, H&K, Hi-Point, Kimber, Ruger, Sig Sauer, Smith & Wesson, SpringField, Star, Taurus, and Walther among others. It can be set up and positioned for either a left or right hand draw. It comes with a tie down to secure the holster in its horizontal position. It can be easily converted from a double shoulder holster to a single holster and an ammo pouch, making it increasingly versatile. The plastic thumb break ensures the safety of both the wearer and his guns. It is easy to use and makes it very simple to easily draw and re-holster your gun. You can’t go wrong having a double shoulder rig as a type of shoulder holster. They are purposely designed for user-experience comfort and function. The following are other advantages of the Pro-Tech Double shoulder holster. The edges of the holster rarely exhibit signs of fraying even after a significant period of use. Its ambidexterity makes it a prime choice for both right and left hand shooters. It provides an excellent concealment option and can be effectively used for concealed carry. The foam padding ensures the shoulder straps do not dig into the shoulders when the holster is worn for a long period of time. Its design offers protection against dirt, debris, moisture and harsh weather elements. It has quite an eye-appealing appearanceIf the recommended size and type of firearm is used, it fits snugly into the holster and doesn’t slip out when the wearer is in motion. The holster is too large for small or compact guns. Due to this holster being majorly constructed from nylon, it is not as durable as other double shoulder holsters that are made from leather. Its stitching tends to come loose after a lot of heavy use. What is the best double rig that I can buy? If you are in need of an efficient and comfortable holster for your guns, you can’t go wrong with the Pro-Tech Double Shoulder Holster. It is versatile and can function as either a double or a single shoulder holster whenever the need arises. A key point to note is that the functionality of this holster does not affect its look appearance. There are only a few holsters that are able to efficiently combine aesthetics, performance, and comfort at an affordable price. 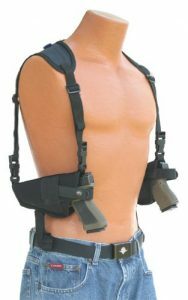 This makes the Pro-Tech double Shoulder Holster one of the best double shoulder holsters in the market. Purchasing a double shoulder holster, which is capable of meeting your needs as a gun enthusiast is extremely important. Any holster on your wish list should be able to accommodate your guns’ sizes, can offer maximum comfort even when worn for a longer period of time, can provide easy draw and has re-holstering feature for both guns. 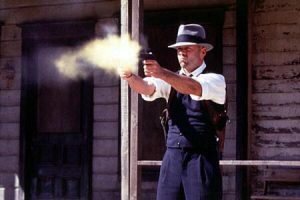 The holster must be created with impeccable workmanship. Strive to look for holsters that are made from leather, Kydex, and Nylon. These type of materials are durable.